The answer is No. 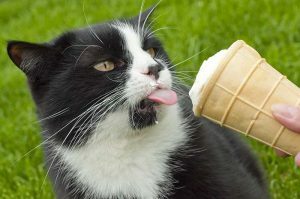 Ice cream is not a healthy choice for cats – neither regular, nor the different variants (like cones, cookies, sandwich ice creams), nor should offer dog/cat ice creams to them. Like we all know, ice cream is a dairy product with its main ingredient as milk, and no milk (other than its mother’s) is right for your kitty, since, like many humans, cats are usually lactose intolerant. Lactose-free ice creams are usually made of soy milk, which is again not suitable for your cat’s general health. Furthermore, when you give it scoops of it, you also can’t rule out the chances of making your cat gain weight by consuming some extra fat, carbs, and sugar. Cats can well differentiate between flavors. There are hundreds of flavored ice creams available in the stores (including chocolate, vanilla, mint, strawberry, pistachio, coconut, coffee, green tea, and so on), and your cat might seem to be fond of one over the other. Your cat’s apparent affinity towards this food can be explained by the fact that most cats are attracted to its milky taste, which is rendered by the carbs and the high fat of the whole milk present in ice cream. Published on January 8th 2018 by Shiloh Nevada under . Article was last reviewed on 8th January 2018.